We had considered the 2 days in St. Petersburg to be the highlight of the cruise, and to say we hated it would be an exaggeration. Let us say we do not feel constrained to visit Russia again. Which is more than the cost of the 2 day tour. We wanted to spend all our time in the Hermitage looking at the great art, with possibly a canal cruise. This is our pattern in many port cities we visit[ed]. But with the above, we booked the tour. We had a really good guide, though she spent a lot of time telling us what drunkards the St. Pete’s citizens are, due to lousy weather and bad government. But she got us to our destinations right as the most popular sites opened. This was a tremendous boon, as there were thousands upon thousands of tourists in town. St. Petersburg is now usually referred to by locals as Peter. Over time is has been called Petrograd, Leningrad and now back to St. Petersburg. But the siege of Leningrad, where more than a million people starved to death, will never be forgotten…or called anything else. We passed a huge monument to the siege, which was the most moving thin I saw in this town. We passed the depressing Stalin era block apartments, which we saw being dressed up in Baltic Germany. Petersburg was built on a swamp by Peter the Great in 1703, using virtual slave labor under miserable conditions. To control the water, canals have been placed in town, much in the manner of Amsterdam and Venice. There are 18th century style palaces lining all the canals. These are built in brick, with smooth stucco in bright colors, and white or gold [yes, real gold] trim. Our first stop was the Summer Palace, somewhat out of town in the Czar’s Village. We were greeted with a 4 man brass band playing from “Swan Lake” and doing a manly pas de danse. The Summer Palace was the get-away for the royals when city life was oppressive or flooded by the Baltic. It has huge formal gardens, with follies and vistas; tea houses and statues; and armies of servants to keep it tidy. We had to don cloth footsies over our shoes to protect the inlaid parquet floors. Then we strolled through dining rooms for every clique you can name, all tricked out with gold leaf and enormous porcelain stoves in Delft blue and white. In Catherine’s Tea House on the lake, we were treated to a capella male singing group, while looking at 6 different boat houses, a massive steam bath house, and two follies. The Summer Palace is undergoing restoration, which includes applying gold leaf to the onion domes of the family chapel and some of the statuary. It amazed me that the current Russian government thinks it worthwhile, but I guess it’s for the tourists. And the famous recreation of the Amber Room is also in the Summer Palace. The original disappeared in the chaos of WWII, and this recreation was finished in 2003, using sketches, original design drawings and early photos. I don’t know what I expected but it wasn’t this. I thought it would glow, with light pouring through somehow, I guess. But it is spectacular, with the various colors of amber creating what one usually sees in wood parquet. It must have been a joy to work on, cutting the amber and piecing it onto wood to create panels and framed vignettes. But I didn’t actually covet it. The luxury and excesses of the Summer Palace brought home to me that a revolution was going to happen in Russia, as soon as the masses got enough food to eat to pull it off. As an American, this class distinction turned my stomach. And it was a tragedy for the Russian people that their revolution only brought much greater suffering. We drove scenically back to town and had lunch at a nightclub called The Trioka. This term refers to the 3-hourse sleds used in the winter by the sporting class. We had borscht and Stroganoff, vodka shooters and champagne. Dazed, we boarded the bus and visited St. Isaac’s Cathedral and the Church on the Spilled Blood. These are both modern restorations, with the latter dating from the early 20th century in any case. Both are in the elaborate Greek Orthodox style, which is a welcome relief from being used as stables and warehouses. 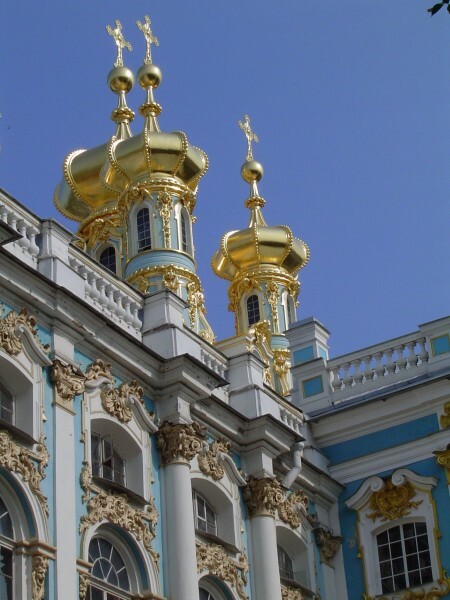 St. Isaac’s dome was gold-plated using mercury, a process which is fatal to the craftsmen. Inside, at the Iconostasis, were featured columns of lapis lazuli veneer and larger columns of green malachite which is supposed to help prevent hang-overs. I got me a ring of this stone, just in case. The Church on the Spilled Blood was built on the very site where Alexander II was assassinated in 1881. To do this, they literally had to take out part of a canal. Alexander was most noted for freeing the serfs in 1861 and is still highly regarded by the local people. In between the churches, we stopped at a very good Cousin Vinny’s, which accepted euros, even in plastic form. Now there’s a visa we could obtain with ease, considering our credit score! The prices were reasonable and the quality good. Undaunted—ok, somewhat daunted--we rose early and caught our tour bus into town. We stopped at St. Isaac’s to photo the exterior with fewer people around and rode past the Winter Palace for the same reason. The enormous parade ground was dominated by an Egyptian obelisk and 2 roaring stunt-type motorcycles. But the cameras were undaunted. Then we boarded a canal boat, though about 6 of us could not be seated on the open deck and we rode below. We got some sense of things, but being closed in was disappointing. But the tour guide was below also and we conveniently asked questions. We had a good map in the guidebook and marked the route with arrows. We then visited St. Nicholas Church; St Nick has always been the patron of sailors, as well as the Santa Claus thing, and this is where the service for the drowned Kursk submariners was held in 2000. The bell tower stands free of and some 100 feet from the body of the church. Due to uneven ground settling the tower and the church were headed in different directions. They decided on a formal separation rather than a complete divorce. The church interior was glorious, with chanting and incense. It is a glory to God to see His Greek Church reborn in Russia. We saw St. Cyril’s grave in Rome and were reminded that he put the Russian language into an alphabet, translated the Bible, and brought it to the Russian and other Slav peoples. Back on the bus, we rode past the “Bronze Horseman” statue, meant to represent Peter the Great. Originally, it had only 2 hoofs to support the mass of the horse and rides, but later a long tail was added for a third point of support. And somehow, he is also treading on a huge snake. But if you ignore the repairs, it is a grand statue. At last, we went to the Hermitage and got there as it opened, brilliantly planned by the tour company. The Hermitage is anything but a monk’s cell, but Catherine the Great thought of it as a little hut for her grand collection of European art. 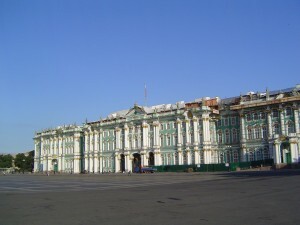 The Hermitage is but a part of the Winter Palace, begun by Peter the Great’s daughter Elizabeth and expanded by Catherine the Great. The Winter Palace is the same brick, covered by stucco with white and gold trim monstrosity that we were growing used to. No, we were growing tired of. But this one is filled with art. We summed up the museum as: some of the best European art displayed under opulent conditions in such a way as to make it almost un-viewable. Oil paintings had been put into frames with glass; a major no-no, as oil outgases forever and has fogged the glass. This does mean that you can get very close to look before the guards yell at you, but it also means that you have to get very close to see anything. To top that, the lighting is miserable. But we soldiered on, listening to our guide ramble on about the lives of the painters, while we ran ahead to see the works before the crowds got there. We could move about 2 rooms away before we lost reception on our headsets, and thus we saw the Cranach the Elder paintings [1400s] and several van Gogh’s. And we utterly skipped the atrocious mechanical clock shaped like a demonic peacock planning a world take-over. The one Caravaggio we wanted to see was gone and the guide said she’d seen it the day before! But a couple of Leonardo’s Madonnas and a small Michelangelo statue were marvelous. We had lunch at one of the Romanov’s 2nd cousin’s wife’s son’s lavish palaces with the champagne and the vodka, caviar and a forgettable main dish. Then we crossed the Neva River for the 400th time and visited the Peter and Paul Fortress, on the site of the original fort built by Peter the Great. We didn’t get a look at the fort, though we have been to any number of similar-age forts, so we were not devastated. The Peter and Paul Church is the burial place of the greats of the Romanovs: Peter the Great and his daughter Elizabeth; Catherine the Great and her milquetoast husband; but impressively, the remains of Czar Nicholas and his family, returned to the family church after decades of being lost and unlamented in Siberia. It seemed symbolic to me of the constant effort of the St. Petersburg citizens to reconcile their turbulent and bloody past with hope for the future. Which means tourist dollars, which pay for all the gold leaf, to bring more tourists. I get that and more power to them. But we agree that we are not hankering to return. Our last stop was The Aurora, the gunboat that shot the cannon to instigate the Bolshevik attack on the Winter Palace. The last thing I wanted was to dwell on that scene, so I hung out near the bus watching large birds taking dirt baths. They all want to use the same ‘cup’ in the dirt rather than start a new one. They get into the ‘tub’ and throw loose dirt all over themselves and then shake it all off. It’s very entertaining to watch. Oh, and Ron went over to take some photos of the gunboat. 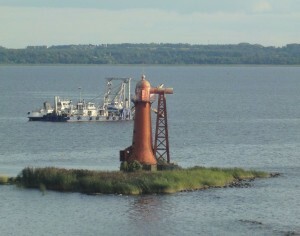 Back on the ship, leaving the port, we saw wonderful outlying islands, some with fortifications and one with the strangest lighthouse ever. 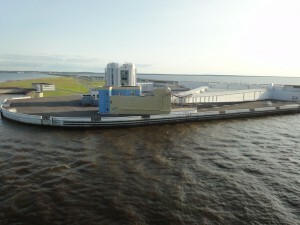 The entrance to the bay leading to the Baltic is now protected with enormous flood barriers, which can be run out to prevent the devastating flooding of St. Petersburg in the past. With all that we saw, these barriers were the most impressive to us. Go figure.